The cries and protests of hundreds of thousands of Syrians joined with those of millions across the country as angry demonstrators marched through the streets of Damascus on Sunday to denounce the Arab League's suspension of this Mediterranean state, and to display their full support to their incumbent President Bashar Al-Assad. The demonstrators cut across social and national divides. Men (some in soldier-like uniform) and women, pupils and students, peasants and businessmen carried banners denouncing what they call the ''illegal'' move by the Arab League and the "conspiracy" against the resistance line of Damascus. The Arab League said that Assad has pressed ahead with a crackdown on eight-month-old pro-democracy demonstrations and failed to open a dialogue with its opponents despite its peace plan brokered on November 2. The United Nations has said more than 3,500 people have been killed in seven months of violence. The Arab League said on Saturday it would impose economic and political sanctions on Syria, and appealed to member states to withdraw their ambassadors, as well as calling for a meeting of Syrian opposition parties. The United Nations on Saturday welcomed the AL decision and joined a chorus of approval for tougher international action against Assad. Today's progression, dubbed the "March of the One Million," was peaceful, unlike a previous rally last night where crowds, armed with sticks and knives, sacked the Saudi embassy, three blocks away from Assad's offices in one of the most heavily policed areas of the capital. Another crowd attacked the Qatari embassy in Damascus and French and Turkish consulates in the city of Latakia, 210 miles north of Damascus on the Mediterranean coast, residents said. On Saturday night the streets of Damascus were clogged by convoys of cars, their young drivers whooping deliriously and tooting their horns in a cacophony of support for Assad. Today's slogans were a measure of anger. "Keep up the fight, you hero, and we will give you the support, Assad," yelled Saeed Salami, on the shoulders of his fellow teenagers, in freezing weather. "Go ahead with your reforms, Assad, and we are behind you forever," read one big banner, whose holder, Mohammed, a 23-year-old university student, was hoarse from shouting. "In our soul and blood we sacrifice you, Assad," read another. So big was the crowd that traffic was put to a standstill and shops were forced to close off in this small city of five million, reputed to be the oldest inhabited city in the world. The procession was similar in many other Syrian cities. Syria's state-run television preempted its regular programming to air marches across the country live - from Damascus, Aleppo, Hassakah, Latakia - and hosting political analysts to refute the AL decision and lavish praise on Assad, the president who took over from his father, Hafez, in 2000. The crowds are large and their chants fiery, but Arab protests, as some analysts put it, are often used by the region's governments to send messages abroad and keep anger over domestic problems in check. The ongoing revolt, locked for eight months in a virtual stalemate between protesters and the regime's security forces, is increasingly breaking into armed clashes that activists and diplomats worry could escalate beyond a point of no return. An armed resistance in Syria would create a vastly more complicated crisis in the region, analysts said. Regional powers, including Turkey and Saudi Arabia, would likely be drawn in, positioning Syria as an arena for regional rivalries between the West's Arab allies and Iran, and threatening sectarian stability in neighboring Iraq and Lebanon. That has both regional and international powers treading carefully. 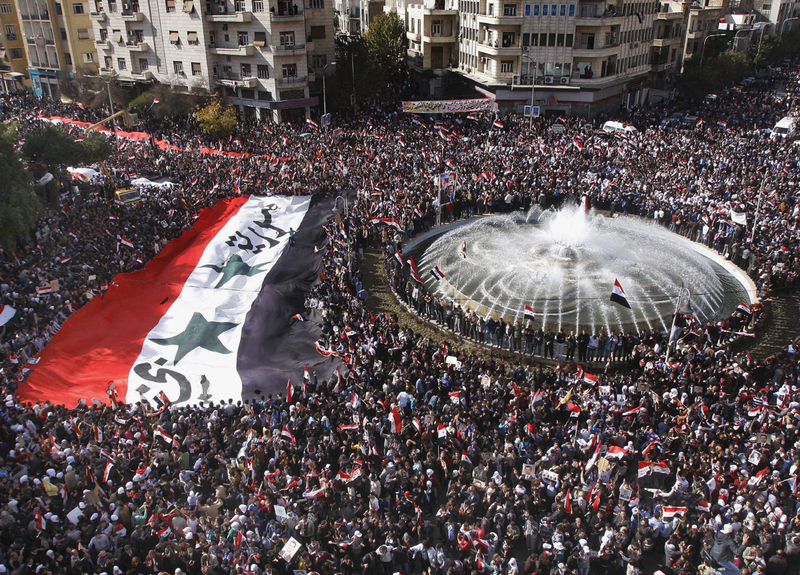 Diplomats are also aware that if they mount any international action against Syria, Damascus could use it to bolster its argument that this year's uprising is being fueled by foreign conspirators. Damascus' approval of the Arab initiative, reached at an Arab foreign ministers' meeting in Cairo a week ago, reflected painful concessions by the Syrian regime with regard to the withdrawal of military vehicles from Syrian cities, stopping bloodshed, the release of prisoners, allowing foreign media outlets to cover what is happening in Syria, and the launch of dialogue with protesters within two weeks. The proposal could have been the last chance in a string of international efforts to ease the crisis, which has led to wide condemnation of the government. European Union and U.S. sanctions are chipping away at Syria's ailing economy, and many world leaders have called on Assad to step down. Syria's regime last week urged the Arab League to help it against the US, which it accused of involvement in "bloody events," through its calls for the "armed groups" not to hand over their weapons to the government.